I was having a discussion about why we don't see all of our friends' updates on Facebook. There is no shortage of times when I haven't seen a friend's update in my Facebook feed only to explicitly check their wall to find that I've missed a slew of updates that were never displayed in my stream. This can be annoying. The best answer I've come up with is that Facebook displays updates based on how much you interact with others. I've come up with a solution when there's someone who I really want to follow. Usually, these are friends or family who don't post very often, but, when they do, I want to know about it. 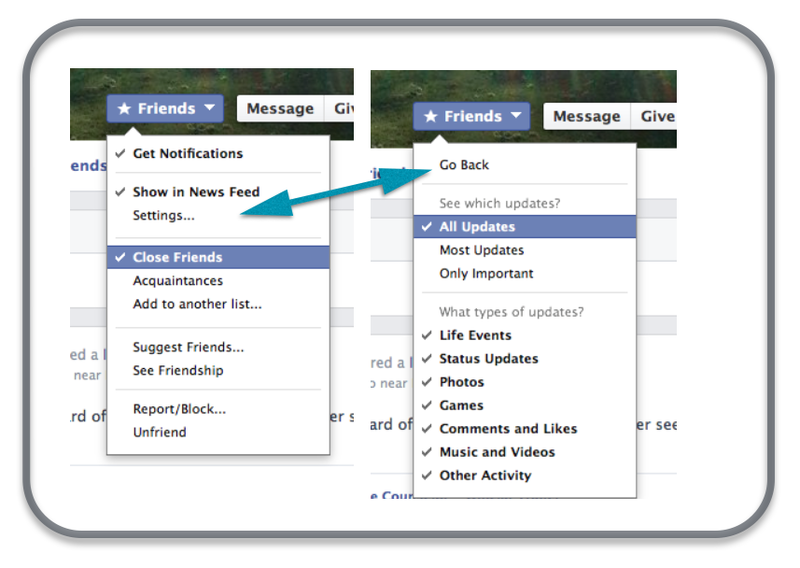 To explicitly receive all of their updates, I visit their Facebook page and mouse over the Friends button which displays a drop-down menu. On that menu I'll check the Close Friends setting and then click the Settings... option which allows me to pick exactly which updates I'll receive. Now, whenever they make an update, I'll receive a red badge notification icon in my web browser and a push notification to my iOS devices. Like most things on Facebook, it's simple, but only if you know exactly where to look.